I’ve wanted to review this award-winning bar for awhile. Ever since I saw it on the Academy of chocolate list, I’ve wondered… I don’t rememvber it on my table but there were 60 bars each of 3 teams were going through and I imagine some other lucky table without Ms Russian Judge here. In judging, I am a harsh judge holding everything to the same standard whereas here on the blog I am much more forgiving and only review chocolates withtheir peers. This bar is wrapped in the fun brown paper I have come to associate with Melt. I love walking into a Melt shop and seeing all the bars and Mud Pies and Brownies laid out. To smell the chocolate and see the awards. 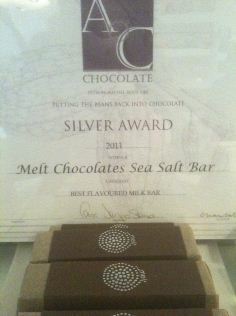 Melt seems to an outsider with all their Academy of Chocolate awards to be one of the most AoC awarded chocolatiers around but I don’t know if that is accurate. You can see how large the chunks are – three “squares” on a 45g bar means 15g a ‘bite’ 🙂 I feel like, as this is a filled bar, that this makes the chunks you are able to separate too big to eat easily but I wonder if more indentations would have compromised the structre and transportability of the bar. The last thing anyone wants is a handbag or pocket full of caramel! Thank goodness for the thick chocolate then! In this bar after trying to eat a square I feel like the delicious chocolate was a bit too thick – I found myself biting a bit of the base of one square before biting my way around the walls. I know that for many chocolate lovers, this is going to be a kind of heaven and that is likely why the milk version won AoC silver. The chocolate is quality so I don’t mind but the vanilla really hits you and makes you notice it when the chocolate combines with the caramel. 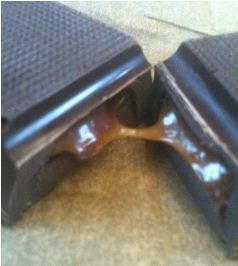 I feel that for my palette that the sea salt caramel is thick but I’m missing that molassas edge. I am loving the depth it does have though and while it uses Madron sea salt, I’m not getting as much distinctive flavour. It has left me wondering how absolutely yummy this would be in milk chocolate. I have a sweet tooth and I’m sure it would be awesome. Overall, the bar left me wanting more – more sea salt caracel and more bites so this can only be a good thing. Taste is personal and that is what makes life so interesting and why some will love this abr and some won’t. I don’t like coconut and some love it so if you like something sweet but prefer it balanced off against dark chocolate and don’t mind vanilla, give this bar a try. And while you’re at it buy some of the coffee caramels, the caramel in twists of paper and the Melt Wine dark chocolate bar You won’t regret it!